Gingerbread, honied and spiced pastry, is as old as human society. The oldest mention about sugar article is from Egypt 2000 B. C. How also findings in Egypt pyramids shows, was this sweet goody prepared for pharaohs, but also for patrice in Old Rome. In medieval middle Europe is the oldest mention about gingerbread in year 1293, when was found the first Gingerbread guild. Gingerbread belongs to Pardubice like Pilsner Urquell to Plzeň, even though Pardubice's beer is excellent too. Gingerbread nicely wrapped in cellophane is dellivered to all corners of the Czech Republic and abroad. It is cheap,tasty, nutritious and healthy. It represents the most typical traditional sweet. 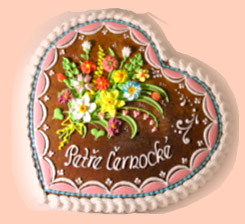 Pardubice gingerbread production is distinctive because today's factory labour is connected with a hundred-year-old craft tradition. 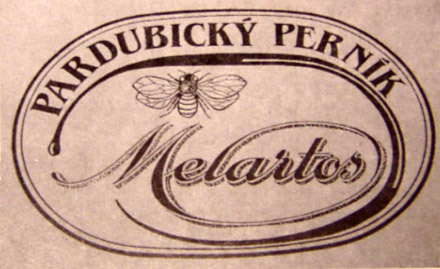 In1977, the Friends of the Greater Pardubice Area News printed an article by Zdeněk Cinkan titled,"History of Pardubice's gingerbread, or I'll show you what Pardubice's gingerbread is worth." The article begins: "Our city Pardubice is called a city of gingerbread from time immemorial. An example is the folk saying, 'I'll show you what Pardubice's gingerbread is worth.' As we unravel the secrets of the Archives, we find out that the first mention of Pardubice's gingerbread craftsmanship dates to year 1515, under the rule of Vilém of Pernstein. Later, under Vojtěch of Pernstein, one street was supposedly called Gingerbread Street." Pardubice's gingerbread was and remains known worldwide despite these turns of events, difficulties and views in its past. Undoubtedly, gingerbread made from Pardubice famous long before sports, chemistry, explosives or electronics such as radars. Pardubice's gingerbread, which the city takes great pride in as one of its symbols, has to baked in Pardubice as of February 27, 2008. As of this date it is protected by European Union (EU) law. An official certificate, confirming that Pardubice's gingerbread is recorded in a register of Protected Labels of Origin and Protected Geographical Labels, has been issued to the representatives of Pardubice's Gingerbread Association. The bakers must comply with all the rules set forth by the certificate and produce a high quality product. In the EU, Pardubice's gingerbread is registered as the 10th product of the Czech Republic, which has the highest number of registered products of all the new EU members. According to a database of Czech Labels of Origin and Geografical Labels, Pardubice's gingerbread is a baked product made of wheat flour,sugar, egg, honey, fruit jams, vegetable oils, cocoa, a mixture of spices (cinnamon, coriander, clove, anise and new spice) and lightening agents. 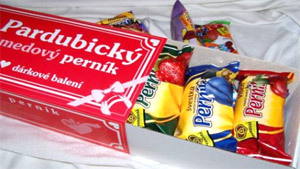 Pardubice's gingerbread is made in two variants. The first, a sandwich-like product, made of two identical pieces of gingerbread dough, connected by fruit jams or white chocolate filling. Products are always glazed with milk chocolate or yoghurt coat. The second, a shaped gingerbread is much more complicated product. It is decorated with sugar icing and marzipan. The entire baking and wrapping procces must happen within the City Limits of Pardubice for the product to officially be called Pardubice's gingerbread.